When looking for Valentine's Day gifts it is hard to go past Valentines Day Cupcakes. On 14th February say "I Love You" with cupcakes. Red roses, jewelry and decadent chocolates are very characteristic of Valentine's Day. These are often a symbol of love given to that special someone in your life. How about Valentines cupcakes? How do they fit into this most romantic day of the year? Can you imagine anything better than a small cake covered in a sweet cloud of frosting and decorated with a delicate sugary flower? For your special someone, why not try something a bit unconventional and fun? Cupcakes come in flavors, shapes, sizes and colors of all sorts. They can be dressed elegantly, look chic, be playful, fun, whimsical or simple and understated. They are a delicious way to show someone you care. If you know your other half's favorite flavor, color or cupcake, you have a one up. Nothing is more romantic than someone who knows you that well. If you are having trouble deciding, no need to worry. Make or order a dozen cupcakes, each with a red rose on top. It is tradition and something new at the same time. 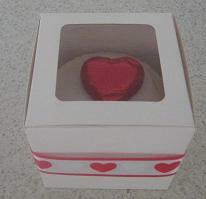 Valentines Day Cupcakes are a playful and creative way to tell someone you love them. Is it just you and some friends on Valentine's Day? Cupcakes are a sure pick-me-up and are bound to put a smile on all your friends faces. Whether you prefer a simple cupcake or a more extravagant one, go ahead and indulge! Everyone loves a good cupcake. It is even better when you get to share. Have cupcakes in everyone's favorite flavors for variety, or get a flavor everyone will love. The options are limitless, have some fun and enjoy yourself! 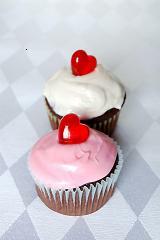 For you and your loved one, Valentines Day cupcakes can be sweet and romantic. They add whimsy and fun to a special day, whether eaten together after a candle-lit dinner or just whenever. If you are still looking for that special someone, there is no need to be disappointed on Valentine's Day. Get some of your good friends together or throw a big party. Order some special cupcakes for everyone. Cupcakes always bring out smiles and laughs. Go ahead, feel young and carefree again! Once you peel that wrapper and a smile sweeps across your face, you will know you made a delicious decision! Making and giving Valentine cupcakes is becoming more popular every year. Red velvet cupcakes are ideal to give your loved one because of their beautiful red color. Top them with cream cheese or buttercream frosting and add a heart shaped decoration or red sprinkles. Alternatively, vanilla cupcakes iced with glace frosting will look really effective if you draw a heart on them with red gel icing. You could also adorn cupcakes with heart shaped chocolates or candies. Make chocolate cupcakes and hold a cappuccino stencil over the cupcake and dust with icing sugar. A heart-shaped stencil is ideal for Valentine's Day. 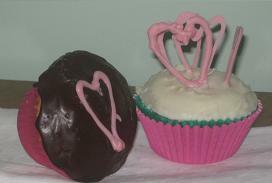 Bleeding Heart cupcakes are also really appropriate for Valentine's Day, especially when made in heart-shaped molds. Make nine Valentines Day cupcakes and frost them with white glace frosting. Arrange them on a plate (three rows of three). On the middle row use red gel icing to write "I' (on the first cake), "Love" or draw a heart (on the second cake) and "You" (on the third cake). You could also arrange the lettering vertically or diagonally. Frost Valentine's Day cupcakes with glace or buttercream frosting. Melt white chocolate and add pink food coloring and stir until combined. Pipe heart shapes onto baking paper and refrigerate until set. You can either stand chocolate hearts into the frosting or lay heart on top. A really impressive gift is to wrap your cupcakes in cupcake cosies. Even if you haven't got time to make Valentines Day cupcakes yourself, follow the link for this gorgeous decorating tip. I love using white fabric with a red and white heart ribbon, but there are so many alternatives. A box of six wrapped cupcakes will look absolutely stunning. 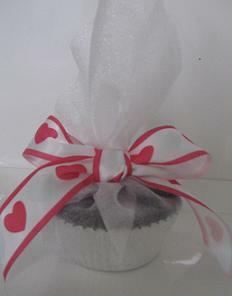 One cupcake boxed in an individual cupcake box, wrapped with ribbon, is another great Valentines Day gift idea. Or, make your Valentines Day cupcakes in heart-shaped cupcake trays. You can use any cupcake recipe and frosting as they will look great without much fuss. Or, decorate your cupcakes with gorgeous Valentines sugar shapes or mini pink and white heart confetti. 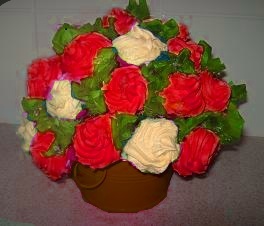 A really impressive gift for Valentine's Day is a cupcake bouquet. This stunning cupcake creation is very easy to make but does require a little patience. It is well worth the effort! I don't know what you think, but to me, it doesn't even matter how the cupcakes really look. The main thing is that someone has made an effort, and that in itself says "I Love You".